A sell-out tribute show is on its way, and music lovers are encouraged to book now or face the sad prospect of missing out. The Jim Reeves and Patsy Cline Tribute Show sold out at Dubbo RSL, with 250 tickets scooped up by country music fans within weeks of its announcement – and with good reason. 'He’ll Have To Go', 'Bimbo', 'Welcome To My World', 'I Love You Because' are just a handful of the hundreds of hits made famous by Gentleman Jim Reeves that will be performed. In this faithful tribute, Royden Donohue will have you believing the late, great star is in the room. With a rich, deep voice reminiscent of Gentleman Jim, Royden will transport you to another time and place — when country music was real and sung from the heart. 'Sweet Dreams', 'I Fall To Pieces', 'Crazy', 'Walkin’ After Midnight', 'Always', 'Three Cigarettes In An Ashtray'...with a catalogue of songs written by some of the greatest wordsmiths in the business, Patsy put her own stamp on every song she sang and recorded. In her authentic portrayal, Marie Hodson takes on the persona of Patsy, relating stories of her life and times. 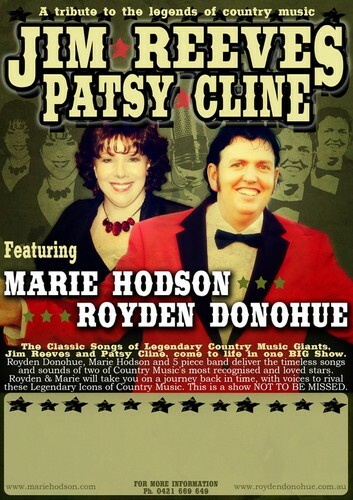 Both Marie and Patsy shared a deep love and respect for traditional country evident in this nostalgic tribute show. This exciting and popular production show comes complete with a group of hand-selected musicians backing the artists ensuring Jim and Patsy are accorded the respect their timeless music deserves.